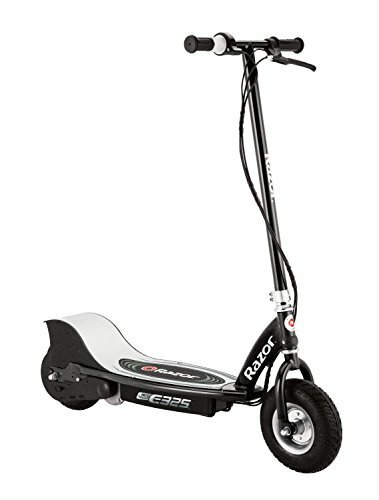 Join the neighborhood gang of hardened, tough-as-nails scooter-ers on this sweet Razor E325 Rechargeable Electric Scooter. Don't get caught ridin' dirty! Evade rival scooter gangs with the E325's powerful, ultra-quiet chain-drive motor at speeds of 15 miles per hour! (Among the fastest Razors ever!) The scooter also includes a pair of extra-wide 10-inch pneumatic tires to ensure your ride feels as smooth as you do on this ultra-cool Razor speed-machine. This scooter's tricked out with variable speed acceleration, a twist-grip throttle, and a rechargeable battery that delivers up to 45 minutes of fun per charge.